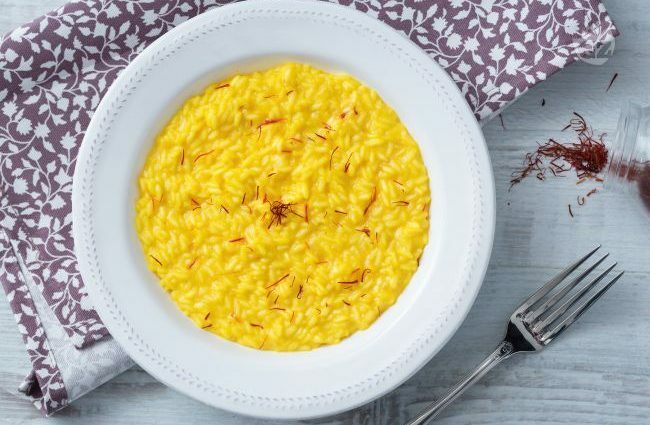 Today we’re gonna cook risotto alla milanese, a traditional, colourful saffron risotto from Lombardy but with an Abruzzo twist. We’re gonna use extra virgin olive oil and pecorino! Put the saffron powder into a glass, add half a ladle of hot broth and dissolve the saffron stirring with a small spoon. Put the olive oil in a large pan, add the finely chopped onion. Sweat over a medium heat for about 2 minutes. Once the onion is soft, add the rice and gently toast it for a minute or two. Add the white wine, keep stirring and let the wine evaporate. Then add the vegetable broth: it should be added at the rate of a couple of ladlefuls at a time and when this is absorbed, add more stock. If you like, add also a bay leaf. Wait about 5 minutes, then add the saffron. Carry on in this way for 15 minutes. During this stage, do not leave the pan alone and stir regularly. When the rice is al dente, remove the pot from the heat, and add the olive oli and pecorino chees. Stir until the ingredients are completely incorporated. Serve the risotto into four warm bowls. Hi Massimo! Where are the measurements?? I want to make this! How much rice, how much onion? Saffron?